Download a PDF of “Goldsbrough Consulting Limited – Standard Terms & Conditions“. Agree payment terms at the outset of a deal and stick to them. Explain our payment procedures to suppliers. Similarly, we expect to be paid according to the terms agreed with our customers. 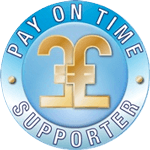 We understand and will exercise our statutory right to claim interest and compensation for debt recovery costs under the late payment legislation if we are not paid according to agreed credit terms. If our polite reminders are ignored, we pass the debt to the court for judgement. Client information is held on secure storage at our office, and on secure cloud storage. Anything related to a client is not divulged to anyone outside the client unless express permission is granted. Client information includes contact information, plans, business performance analysis, financial transactions, and project management data. That client information will have been provided by the client, or provided to the client as a consequence of the project. A client may request the inspection or deletion of client information at any time. We promise to never divulge your contact information to someone without your express permission. We hate spam, and only send out emails from the blog to subscribers who have opted in to our list. If you subscribe to our email updates, you’ll be able to unsubscribe from a link in any of our messages to you. To make sure you receive our emails, add the goldsbrough.biz domain to your ‘safe senders’ list in your email spam filter.